Like we all know, we are in the holy month of Ramadan, where an estimated population of 1.6 billion Muslims worldwide are been engaged in a dawn-to-dusk fasting. Nigeria is not left out in this occasion because there are notable number of Muslims in the country especially in the Northern part. 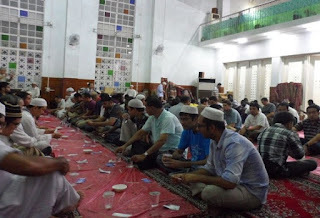 This period is also filled with activities such as prayers and lots of charity giving. While engaging in all this act especially fasting, it is also wise for you to have your health in mind. Laying aside all religious sentiments, there is no doubt that fasting for an entire day and continuously for a whole month can have an impact on your health. Especially if you are a Muslim who is zealously engaged in it throughout the fasting month. Recent lifestyles and pressure from your workplace are many factors that you cannot compromise on even during the month of Ramadan, unless you want to receive a nail on the head. In this page, i will be bringing to you 10 tips that will assist you in staying healthy even when you are fully involved in the fasting and yet experiencing a long hours of work at your office or other duties. Read along! Date is a fruit from the date palm, Phoenix dactylifera. They are rich in sugar, potassium and magnesium and they can help you maintain your energy level for as long as you can think of. It also contain fibres and as a result, will help you to take care of your bowel movement, because you can easily get constipated due to fasting. Dates should be the first thing on your platter as you try to fill yourself before sunrise and after sunset. Ensure that you drink sufficient amount of water after you break your fast for the day, so that you do not get dehydrated. Drink at least 8 glasses of water throughout the night so as to remain hydrated during the next day of fasting. The more you consume foods that contains more salt, such as processed, canned or spicy food, the thirstier you feel because sodium is a natural thirst booster. You should consider eating more of fruits and vegetables. No matter how much you feel hungry as a result of the long hours of fasting, you should not shock your body by filling it with all sorts of available foods. For a start, eat a date or two, then you consume a glass of water. Have a bowl of warm soup and some salad before going for the main meal. But in all, ensure that you do not over eat. By doing this, you can avoid bloat and some other related gastrointestinal discomforts. This will definitely be the last thing you will love to experience during Ramadan. Your Iftar (evening meal) should have a balance of carbohydrates like rice, pasta, or potatoes; animal protein like beef, chicken or fish; cooked vegetables and olive oil or flaxseed oil. You should learn to ignore traditional Iftar meals, forget every meals that are fried, greasy and too sweat. Limit your consumption of fat so as to reduce the risk of cardiovascular disease during the period of Ramadan. No matter how weak and sleepy you might feel, remember that if you should skip this meal, that means you have to go without food till the sun sets the next day. Acidity, chest pain, flatulence, nausea, headache, dehydration, fainting, upset stomach and drop in blood sugar level are common effects of continuous fasting, so you have to check all these. For sure, you cannot pray at peace with an ill body. Taking a 15 minutes nap will help to make up for the lost sleep you had to undergo because of Suhur. You can easily use lunch time for your afternoon siesta because it will have a tremendous advantage. Coffee consumption causes headaches and sleeplessness as reported by WebMD. So, you should try as much as possible to avoid it during Ramadan. Following these 10 tips will make you stay healthy while you are fasting during Ramadan, there should not be any substitution for you general health and wellbeing. Feel free to share this message to all your Muslim friends out there on various social media, simply use the social share icons below.